TORONTO, Jan. 14, 2019 /CNW/ - Wondering why more eBooks and eAudiobooks aren't available to borrow? So are Canadian public libraries. 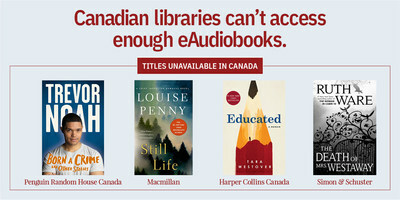 Demand for eAudiobooks is skyrocketing, but major multinational publishers aren't making a number of best-selling titles available to Canadian public libraries, including some prominent Canadian and Indigenous works. Another issue is excessively high prices and restrictive purchasing models for eAudiobooks and eBooks. Libraries lend digital copies just like physical books – on a one-to-one basis. 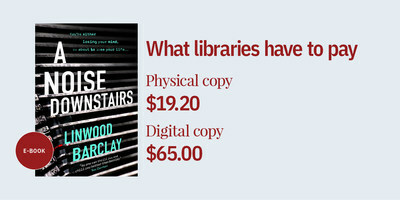 But the prices public libraries pay for digital copies are exponentially higher. "Public libraries are crucial to a vibrant publishing industry. We introduce Canadians to new titles and authors. We have significant purchasing power. These challenges are jeopardizing our ability to provide universal access to content in all its forms, including those who may not be able to visit a library branch or read print materials due to illness or disability," said Vickery Bowles, City Librarian, Toronto Public Library. "We know Canadians love their libraries and care deeply about these issues, and are asking everyone to help us get this message across to major multinational publishers." 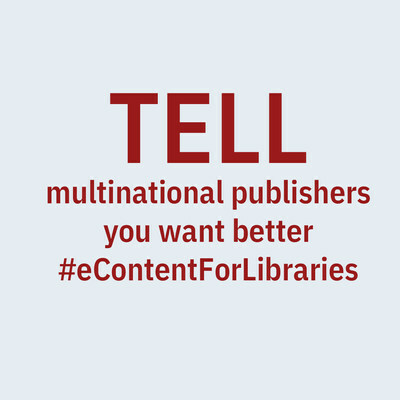 The Canadian Urban Libraries Council is asking Canadians to help resolve these issues by demanding stronger #eContentForLibraries of major multinational publishers: Hachette Book Group, HarperCollins, Macmillan, Penguin Random House and Simon & Schuster. Digital content is the fastest growing area of borrowing for public libraries. Spending by Canada's largest urban libraries increased by more than 45% since 2014 and continues to grow. The Canadian Urban Libraries Council is a national library group dedicated to working collaboratively to build vibrant urban communities by strengthening the capacity of Canada's urban libraries. Our 45 member systems operate almost 700 points of access, and in 2017 were used by citizens more than 385,000,000 times. They represent approximately 80% of the country's public library activity. They employ more than 12,000 Canadians; and purchase more than $100,000,000 of materials each year.